Live and pray with the Franciscan Friars of the Atonement—called to “to heal wounds, to unite what has fallen apart, and to bring home those who have lost their way”—and explore a vocation to religious life with the Franciscan Friars of the Atonement. Single Catholic men under 40 are invited to apply to the Our Lady of the Atonement House of Discernment, which is located in the heart of Manhattan. We are interested in men drawn to: shared life in community, communal prayer, ongoing transformation, mission & ministry, and discerning vowed religious life with us. Want to Live and Pray with the Friars? Participate fully in the communal life of the Friars, which includes shared meals, communal prayer, and community life responsibilities. Commit to your holistic growth and discernment individually, and to the growth and well-being of the community as a whole. Live in residence with the Franciscan Friars of the Atonement for up to a year. Learn more about Catholic, Franciscan, and “At-One-Ment” life of faith through formation and education. Volunteer in a pastoral ministry. If you feel you may be called to take the next step in your journey of discernment, we invite you to request an application for the Our Lady of the Atonement House of Discernment by clicking the button below. You may also be interested in some of our other discernment opportunities. 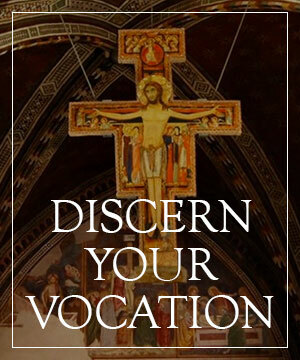 www.atonementfriars.org/discern-your-vocation. For more information about the Our Lady of the Atonement House of Discernment, please contact Paul Krenzelok, Director of Discernment Ministry for Young Adults: 845-424-2122, pkrenzelok@atonementfriars.org.